ANC’s 2015 Budget: for mass struggle for a working class and poor people’s budget! The out-of-touch class arrogance of Finance Minister Nhlanhle Nene was demonstrated not just in the budget he put forward on behalf of the ANC government but also in his choice of ‘jokes’. When announcing a 1% increase in personal income tax on those earning over R180,900 per year, and explaining this would only mean an extra R21 per month for someone earning R200,000 per year, he quipped that, “this category is not in this house [parliament]” to titters of laughter. When he outlined that those with incomes higher than R1.5 million would only pay an extra R1,100 per month he said, building on his earlier joke, “I’m not sure [how many are] in this room” to rapturous laughter. When it came to the increases in alcohol duty, Nene had his super-rich politician friends rolling in the aisles. The increases in beer and wine duty passed in silence, the increase in sparkling wine began to get a response from the MPs, but when Nene announced an increase in whisky duty, joking that “people [the MPs] need to listen very carefully”, the house descended into playful boos and jeers. The contempt of the super-rich politicians for the working class and their indifference to the grinding poverty in which the majority live was exposed in these few brief moments. But many a true word is said in jest – Nene is right! The basic annual salary for an MP is R900,000 per year; for the ANC ministers it is far higher. In September, when the Parliamentary Register of Members Interests was published, 370 out of 400 MPs declared that they had incomes in addition to their already sky-high parliamentary salaries. The most disgusting levels of personal wealth are owned by those politicians who do not just govern on behalf of the capitalist class but have also entered their ranks. ANC deputy president and deputy president of the country, Cyril Ramaphosa, has shareholdings worth R76 million and owns 30 houses in Johannesburg alone. Baleka Mbete, ANC chairperson and speaker of the house, owns shares worth more than R27 million. Nene, and the ANC capitalists mock the working class and poor majority amongst whom the median wage (i.e. where half the population gets less and half more) is less than R3,500 per month (R42,000 per year). WASP believes that all elected public officials should only take the average wage of a skilled worker with all their expenses published for public scrutiny. We also support the introduction of legislation requiring political parties to disclose their funding. The redistribution of some crumbs from the plates of the middle class to the working class cannot disguise that this was a budget for the capitalist class. The tinkering around the edges, including tiny social grant increases and relief on transfer duty, will be welcomed by those working and middle class people who will benefit. But Nene refused to rule out a VAT increase in the near future, which will hit the working class hardest, taking back with one hand what he gave with the other. Nene has slashed R25 billion from government spending next year. This means real terms budget cuts of around 2% across government departments. This may not sound like a huge amount, but it must be remembered that 2004-2010 saw average growth in spending of 9% and that was not able to solve the problems of mass unemployment, poor service delivery, inadequate housing, water, sanitation and roads. In our new year statement we warned the working class to be “on their guard against the double-speak” inevitable in the budget. Nene did not disappoint. He announced the “consolidation of government personnel numbers” – i.e. the cutting of public sector jobs which will fuel unemployment. He said he aimed at “reducing workplace conflict” – i.e. clamping down on strike action as workers struggle to improve their living standards. He reaffirmed that “cost recovery from road users will continue to be the principle financial mechanism for major road users” – i.e. e-tolls will continue in one form or another. And finally we were told that “fiscal support” for the parastatals like Eskom, SAA and the Post Office will be “financed by asset sales” – i.e. privatisation, the handing-over of public property to the capitalist class to profit from. To rub salt in the wound, Cryril Ramaphopsa will oversee privatisation which is little different to putting the fox in charge of the hen house! The underlying necessity for this budget from the point of view of the ANC government and the capitalist class is the crisis of South African and global capitalism. 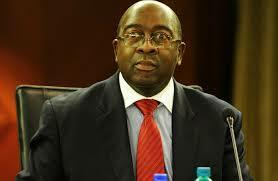 Nene has again revised down growth for this year from 2.5% to 2%. He says it might get to 3% in 2017, but this is still 2% below the level that even the ANC admits is necessary to make any difference to unemployment. Across the world the capitalist system is in chaos. Political crises are being provoked on every continent as the capitalist class tries to offload the crisis of capitalism onto the working class. But everywhere they face resistance – the class war is escalating. Looming in the background of this budget were the global credit rating agencies. These unelected policemen of the global capitalist financial system, appointed by the imperialist powers, have threatened to provoke an economic crisis. Their weapon of choice is to downgrade SA’s credit rating to ‘junk status’. The ANC government is spending more than it receives in taxes every year. It plugs the difference by borrowing money from the capitalist class who demand the repayment of the loan plus interest (their profit). This year the capitalist class will receive R115 billion in interest payments from the government. Within two years they will be receiving R153 billion per year. The working class and poor are being kept in poverty to guarantee the profits of the capitalist financiers. But still that is not enough for them! The ANC government, like anyone who borrows too much money is in danger of not being able to repay its loans. If this happened it would have to declare itself bankrupt. Nobody lends money to bankrupts except mashonisa who charge sky-high interest rates. For a government already dependent on loans to function, this would be a disaster – public sector wages would go unpaid and government services would close down. This is the threat the ratings agencies are making to safeguard capitalist profits. Fortunately for them, the ‘threat’ was never more than a ‘quiet word with a friend’ as the ANC government long ago accepted the rules of capitalism. This budget confirms that they are happy to toe the line. In fact Nene was at pains to boast about the capitalist playground the ANC has helped to create in SA – with healthy capital and property markets and a competitive tax regime (corporate tax is lower today than in 1994). The Democratic Alliance, in their shadow budget, showed that they only disagree on the detail of how to make SA a capitalist ‘paradise’. WASP struggles for the nationalisation of the banking and finance sector and for the introduction of a state monopoly of foreign trade and capital controls all under the democratic control of the working class as the answer to the threats of the ratings agencies and the imperialist powers behind them. This budget is a declaration that the ANC government, and the capitalist class they represent, are increasing the intensity of the class war they already wage on workers, communities, the poor and the youth. We must answer with determined struggle and by raising a clear socialist alternative. 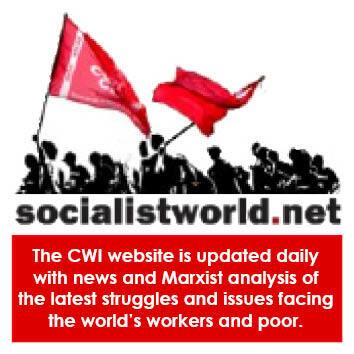 The only way to improve the living standards of the working class majority – higher wages, adequate housing, water and sanitation, free education and healthcare – is to take the commanding heights of the economy out of the hands of the capitalist class. The mines, the banks, the commercial farms, big factories and big businesses must be nationalised under democratic worker and community control as a step toward the creation of a socialist society. This will unlock the vast wealth that the working class itself creates that currently goes to the capitalist class in obscene profits – not least of all interest payments on government loans! WASP supported the budget day protests of NUMSA’s United Front (UF) in Cape Town and will be participating in the Provincial budget protests in Gauteng, the North West and elsewhere next week. However, the national UF leadership’s reply to the budget, the Memorandum of People’s Demands, does not offer any real alternative to Nene’s budget or point a way forward for the struggles of the working class. Indeed the document fails to talk about the working class but talks about “the people” instead. But this is the same language of class collaboration that Nene himself used in presenting the budget, the better to disguise his class agenda. Nene called for the “unity” of “government, labour, business and all South Africans”, i.e. “the people”. But “the people” are composed of classes with opposing interests. We must bring clarity where the ANC sows confusion, repeating (even unintentionally) their language will not assist with that. The UF leadership also fails to name the ANC government or capitalism as the cause of the working classes’ suffering. Neither “ANC” nor “capitalism” appears once in their statement. Unfortunately, neither does the word socialism or nationalisation and struggle is only mentioned in the most abstract way. The Freedom Charter, which the NUMSA leadership themselves admit is not a socialist programme, goes further than the national UF leadership’s statement in a period when world capitalism is in a crippling crisis and revolution and counter-revolution play-out on every continent. The UF will not develop into the mass movement we want and need it to become if instead of giving a lead to the working class it lags behind them. The Workers & Socialist Party calls for the creation of a country-wide socialist civic to unite the service delivery protests, the creation of a socialist trade union federation out of the ashes of Cosatu, and a mass revolutionary youth movement uniting the students and the unemployed youth of the townships. But more, we call for the creation of a mass workers party with a socialist programme so that in the future we can implement a budget of the working class and poor. WASP’s youth wing – the Socialist Youth Movement, is playing a key role in the struggles of the students at the Tshwane University of Technology and are taking their protests to the department of Higher Education next week; we are supporting the service delivery march of the Gauteng Civic Association to the Union Buildings on 11 March which will be an important step in the creation of a country-wide socialist civic; we are preparing a campaign of workers struggle to ensure the bosses’ compliance with anti-labour broking legislation. Only mass struggle, guided by a revolutionary socialist programme, can push back the attacks of the capitalist class and push forward to a socialist future. Posted in Articles | Comments Off on ANC’s 2015 Budget: for mass struggle for a working class and poor people’s budget!